As licensed professionals ourselves, we feel compelled to point out that despite what the Downtown Express may say, our fact-checker, who is in from his long coffee break this afternoon, looked up Frank Sciame on New York State's Online Verification of licensed professional, and there is no one with the last name "Sciame" licensed as an engineer in New York State. But perhaps the profession "construction engineer", as quoted from the above-referenced article, does not require a license for someone to legally practice it? But then again, with no license, how does one get professional liability insurance? Thanks to Curbed for pointing us to the error-ridden article. 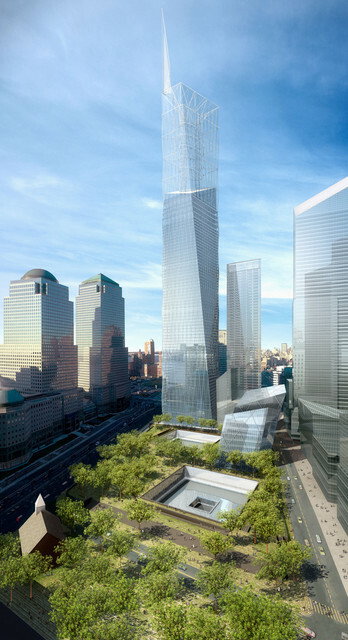 Miss Representation calls it like it is, mostly, about the choice to let a contractor lead the value engineering (read: redesign) team for the World Trade Center Memorial. It needs little comment. Our Zaha/Diva entry got several replies. 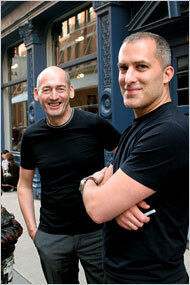 Most of them were speculation, or unsupported hearsay, so we decline to publish those comments. However, we do point out an anecdote that we suppose someone else saw at the press conference prior to the press preview of the Guggenheim show. 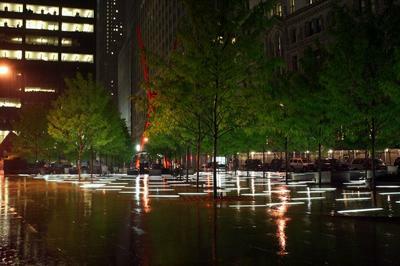 File under "Light-up Parks In Lower Manhattan": A Test Of Will turns it out with a spread of night-shots of the new Liberty Park. Thriller set, indeed. We'll be dancing down there soon. 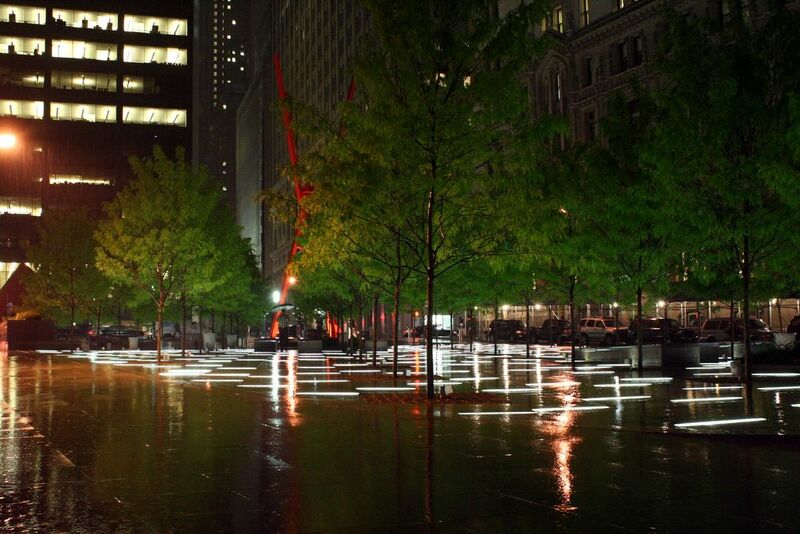 Even though it is weirdly called "Zucotti Park". 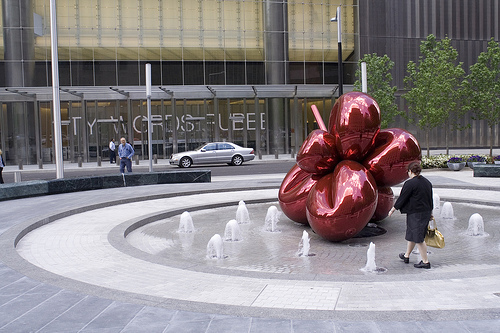 Via Curbed, the best architecture weblog NYC has to offer. 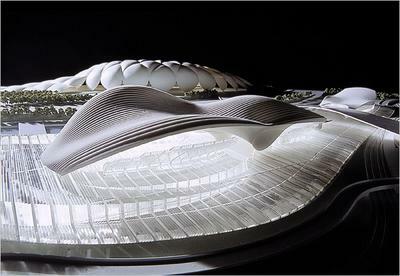 Does Zaha Hadid ever get tired of being called a Diva? As in "just because I'm a famous female architect and I'm plus sized and I'm a little older than the rest doesn't automatically make me a diva"? Just curious. Last Friday, hours before the end of business on Memorial Day weekend, the World Trade Center Memorial Foundation president and chief executive, Gretchen Dykstra, resigned. We totally didn't see that one coming, particularly after every public official in the state gave the Foundation such a hiding over the cost estimate that had "reached" one billion dollars. Mayor Bloomberg, in an unusual display of horses gone, close barn door activity, said that "I don't know that her leaving is going to solve any problems. Quite the contrary, it just makes it more complex because you don't have her." Thanks Mayor, that totally helped. Why don't you do what all great New York mayors do: put a contractor in charge. Just appoint Frank Sciame of Sciame Construction to head the Foundation? Will totally streamline the process. 1. Miss Representation comes back from a quiet spell to chat about the progress at Ground Zero. 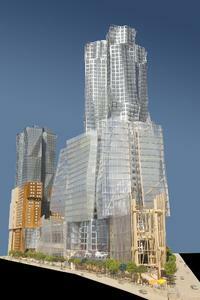 And to comment on 7WTC, which we like too. And to give us this golden, priceless bit of blogging: "Every once in a while I want to feel the strange mixture of dystopian social evolution and sexual awakening that was Logan’s Run, and now I have a place to go (though, unfortunately, Jenny Argutter won’t turn up in a pelt)." 2. Lisa at Polis gives us a bit of irony, and seredipity, worthy of a great Situationist. 3. Greg Allen remixed Curbed today to create, what else, a meta sculpture about a sculpture and something people mistook as sculpture. "Throwing Good Money After Arad"
Greg Allen is on a roll this week. Commentary on the article about Michael Arad and the WTC Memorial fiasco, as appearing in something called "New York Magazine". Our favorite line: "that Organ Grinder's Monkey For Freedom himself, Daniel Libeskind"
Do You Want Some Coffee?, center of all architecture lectures everywhere, posts about tomorrow's discussion called "Garden, Don't Destroy Brooklyn" [editor's note: whatev], 9am—6pm, at 205 Berkeley Place (Between 7th and 8th Avenue, Park Slope). We also point you to Curbed's non-stop coverage of this development. Okay. Tropolism will not be all-WTC, all-the-time. But some interesting stuff has been happening lately. Today, we learn that the National Trust for Historic Preservation has put the "Survivors Stairway" on its list of most endangered historical places. As Ground Zero gets caught up in the Mayor/Governors/Port Authority/Silverstein/Families cagefight, stuff is happening down there. Crews are working anyway. An artifact like this could easily be swept away; it would take a couple of guys, a Bobcat, a six pack, and one Sicilian pie to get the job done in an afternoon. And, if the stair is a historical place, it would be all too easy to have it taken away without some kind of consideration. We're happy to see the Trust step into this; we're not sure there is anyone else looking out for the artifacts. 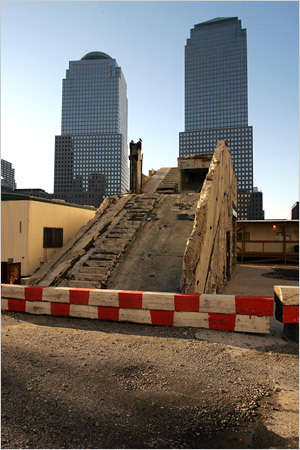 The New York Times reports that the new estimate for the WTC Memorial is now nearly one billion dollars. What a big surprise! I'm sure some of the complaining architecture sites out there already are calling it an exposé and Phillip Noble has his next Metropolis complaint complete. The ensuing debate over costs and potential design changes may also raise once again the possibility that the Port Authority would take over construction of the memorial from the foundation. Last fall, both Governor Pataki and Mayor Bloomberg seemed to endorse the idea. State officials in the last week have expressed a lack of confidence in the foundation’s ability to build the memorial complex. Also of interest is the items included in this new estimate. $300 million for site preparation, $71 million for a chiller plant, and $25 million for insurance (why is an operating expense in here?). Essentially, Bovis Lend Lease added everything and the kitchen sink in an effort to create a headline of "OMG WTC MEM AT $1B" for the Post, probably at the wink-nod of the governor. But the items enumerated are arguably things the state should provide to the foundation: a buildable site, heating and cooling infrastructure, etc. It isn't a commercial tenant trying to develop valuable real estate in Lower Manhattan. 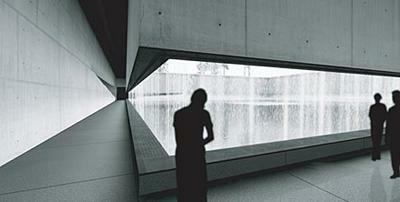 It's a memorial, something that should be the focal point for our healing. Apparently it's also another field for playing power-ball. 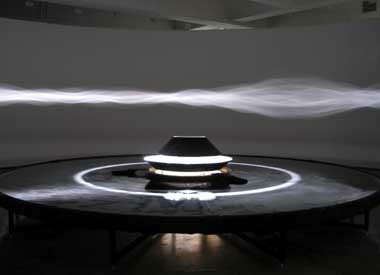 In case you missed last Friday's opening, Olafur Eliasson is the inaugural installation at Tanya Bonakdar's expanded gallery on 21st Street, Chelsea, Manhattan, New York. The show is stunning, even by OE standards. My favorite piece is the compass piece. To describe any more would kill it. 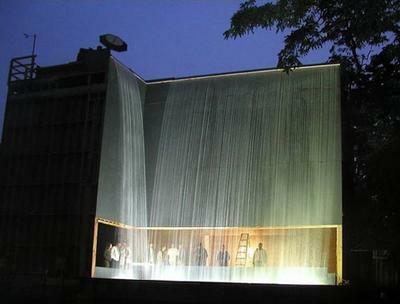 For some interesting observations on Olafur's work, and Olafur as an author, read Greg Allen's What He Really Wants To Do Is Not Direct. We here at Tropolism believe in being very clear, so we'd like to say a little more about our admiration of Jane Jacobs, just so others don't get the wrong idea. In her time, in her context, we have unqualified admiration for her work. She was able to mobilize people to get involved in choices about urban development. 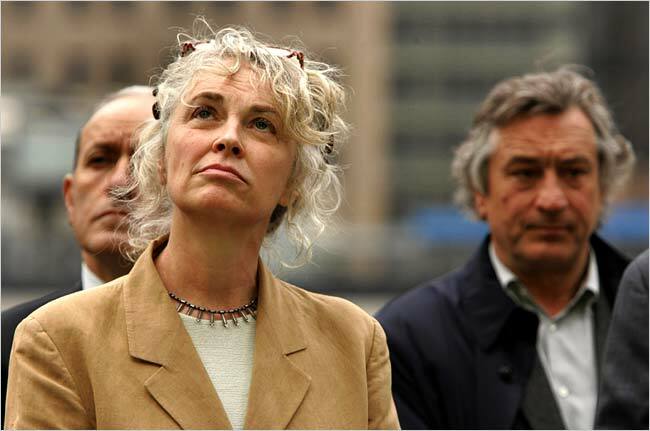 She created a public appetite for good city planning. She wrote a book that captured the city in the way the urban theories of the time did not, and created an appetite for living in the city. But a regular reader of Tropolism will know that we do not believe Death and Life is a guidebook by which New York, or any other city, should be beholden. We see it as a piece of a constellation of ideas. In fact, our one and only mention of Baby Jane up to her death was in the context of a radical interpretation of her ideas, that diversity in our cities goes way beyond far West Village townhouses. We also recognize that the problem of where to put a rapidly growing population are never really satisfied by this small-scale approach, either. We love density, brutalism, tree-lined streets, art deco, Memphis style, Modern Style, Any Style and everything else inbetween. And we still don't like the Sculpture for Living. And so we found ourselves agreeing with Mr. Ouroussoff about how New York has outgrown JJ, both in physical size, size of population, and in the complexity of problems we face. We don't see Lincoln Center or the old WTC plaza as the best possible examples of a new kind of super-diversity, but that's the shortcoming of Mr. O. We prefer to think of glass towers by starchitects with only 24 units as an example of this, because it signals a culture with the ability to blur public and private boundaries, a culture that loves density in all its forms. I found this one in the Paper version of WIRED Magazine. The Borough of Queens is looking to redevelop Landing Lights Park, a half mile strip of land adjacent to LaGuardia Airport. Side stepping a more traditional approach, the Borough decided to import the park in the Second Life; the online community, and asked the residents to redesign it. The elements whether it be benches, swings, jogging paths will then be implemented into the physical park. What ever the result, this is a great experiment in how we can use technology to open public space decision making to more people. Do Tanks,Democracy Island is the group, and place, organizing this and several other "County Fair" type meetings online in Second Life. Democracy Island takes on a kind of Science Fair format where presenters can set up booths and hold meetings. participants can then moved from one meeting or booth the the next. 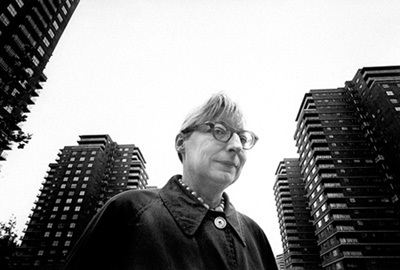 In rememberance of Jane Jacobs, Lisa at Polis proposes a gathering at 555 Hudson Street in the West Village between Perry and W. 11th, where she lived and created The Death and Life of Great American Cities. Drop Lisa a line if you're interested.